How many times have you struggled through icons and bookmarks simply to search the web via Google? Search your Gmail? Or maybe find a book on Amazon? Or even search Wikipedia? Stocks, maps, software - its all just a click away - literally - with GoogHelper. 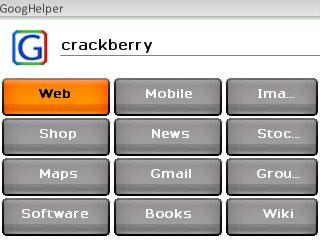 The application's main goal is to cut down on the time and effort it takes to search from your mobile browser. Enter you search term, and click one of the twelve icons - thats that. No more scrolling to the browser, waiting for it to load, finding a bookmark or entering an address. 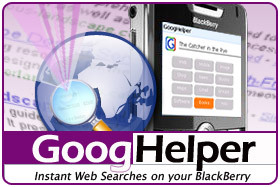 With GoogHelper the Blackberry browser instantly pops up, taking you to Google, Amazon, Wikipedia or wherever you choose. once you click the Application Shortcut. A great little app that is a big time saver. If you do many searches for maps, stocks, books or anything in general really, GoogHelper is well worth it at only $4.95. 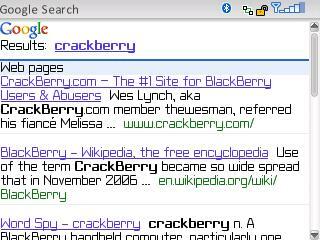 The only pitfall I found is that results are loaded in the standard BlackBerry web browser. It would be great if you could tell the results to load in another 3rd party installed browser, aka OperaMini . 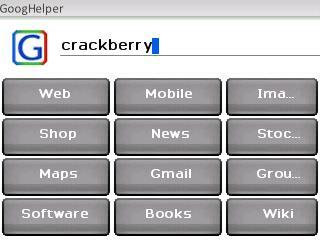 A three day trial is available as well as the full version in the ShopCrackBerry Software Store.